3898,80: UNID STATION @ 00.38. SINPO 22122. 3931,70: Radio Rainbow via LHH @ 21.31. SINPO 44233. Transmission on "Blondie" group. 3930: Antonio Radio (tent) @ 22.39. SINPO 35243. Still listening to Boney M played by Antonio Radio at 23.09 UTC with SINPO here 35222 (annoying noise due to city downtown environment). At 23.15 playing Rolling Stones - propagation somewhat improved. 6220: Mystery Radio @ 17.10. SINPO 54444. Still listening at 22.28 when SINPO is 55555 ! 6220: Mystery Radio @ 17.04. SINPO 54454. Today also excellent signal, as usual in recent days ! Very good signal also at 18.36 UTC. Playing Depeche Mode mix version. At 19.40 SINPO 31441 - co-channeled with RTE, but Mystery Radio signal seems to be somewhat stronger. At 20.33 UTC signal is booming in with SINPO 55555. 6874: Playback Radio @ 20.00. SINPO 32233. Playing Enya song and talk in Italian. 6220: Mystery Radio @ 17.31. SINPO 44454. Today also good signal. Still good signal at 18.44 UTC: SINPO 54444. 3904: Skyline International Radio @ 17.56. SINPO 22232. 6220: Mystery Radio @ 17.48. SINPO 54444. Today again excellent, strong signal ! ID at 17.50. Still good signal at 19.02 UTC. Mystery Radio still on air at 20.46 UTC, no co-channel RTE, but propagation somewhat worse: SINPO 44433. But signal fully usable and audible. At 21.01 UTC signal faded nearly completelly - SINPO 14211. 6220: Mystery Radio @ 17.28. SINPO 44344. Good signal. ID given at 17.39. Still good signal at 18.37. Later, even improving further, at 18.54 with SINPO 53444. Still listening at 19.41 (SINPO is 54454). Excellent signal still at 20.28. 6300: Playback International @ 15.50. SINPO 44444. 4024,60: Laser Hot Hits @ 19.34. SINPO 12232. Audible only when using narrow filter and LSB button (on wider filer strong utility station interference). ID given at 19.35 UTC. 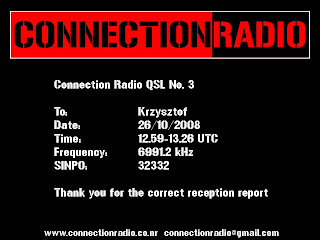 Here is QSL card I got today from Connection Radio, Hungary. Thanks a lot ! 6220: Mystery Radio @ 09.28. SINPO 44344. 6850: Radio Playback International @ 19.05. SINPO 32222. 6553,70: UNID station @ 15.33. SINPO 31222. 6850: Playback International @ 15.44. SINPO 33223. Playing a cover version of "All along the Watchtower" of Hendrix. 6215,40: Delta Radio (tent) @ 15.49. SINPO 23222. 3900 (LSB): UNID station @ 20.03. SINPO 33243. Playing Laura Branigan's tune "Self Control". Seems it is the same station heared around 19.30 with Latin American tunes. 5800: UNID station @ 09.29. SINPO 24232. Playing "Benny Hill show" tune and Borderhunter Summermeeting 2009 promo. Signing off at 09.34. 6265: UNID station @ 09.39. SINPO 23222. Playing "Sultans of Swing" by Dire Straits. 6297,20: Delta Radio @ 15.25. SINPO 33232. ID given at 15.31 and 15.34 UTC. Playing Mick Jagger at 15.35 UTC. 6310: UNID station @ 17.02. SINPO 31232. Strong utility interference. 6880: Radio Playback @ 17.00. SINPO 33333. Still on air when checked at 21.33 UTC.